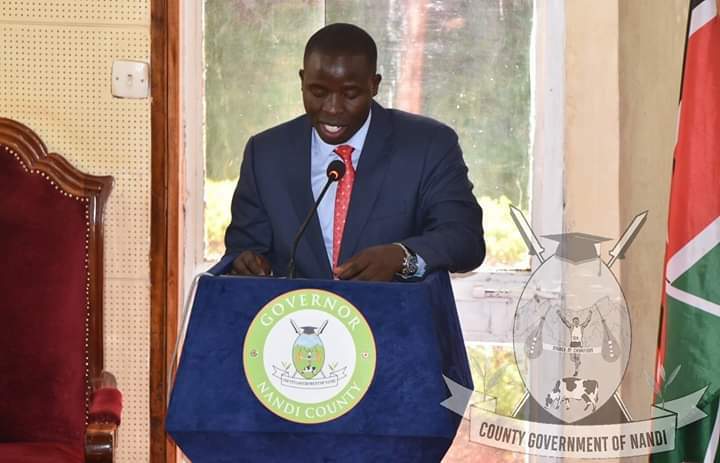 Governor Sang used the address to highlight the county’s transformational progress as well as enumerating current and future development plans of his administration. In his address, the Governor said that tremendous progress has been made in all the sectors of development. Governor Sang delivering his state of the county address. He noted that under his two year reign, Nandi had scored many firsts in different fronts. Sang said that the office of the Ombudsman ranked the county for the first time since its inception as the second most transparent county in the country. The County boss enumerated the progress that has been made in the health sector. He said that improvement of the health sector was one of his priority and the problem of missing drugs in health facilities across the county was now a thing of the past since he has ensured that there is constant supply of drugs and other medical supplies in all the health facilities across the county. Deputy Governor Dr Yulita Mitei together with the County Secretary following the address from the Gallery. He added that existing health facilities across the county had been renovated and upgraded so as to relieve pressure from the Kapsabet County Referral Hospital which has undergone a facelift and can now offer Dialysis and MRI services. Governor Sang indicated construction of a theatre in Kapsabet and Nandi hills hospitals were complete while the installation of a CT scan is ongoing in Kapsabet. Among other projects in the health sector, Sang disclosed that expansion of outpatient service and installation of a standby generators in Kapsabet and Nandi hills hospitals were complete and an Oxygen plant will be installed at the County referral Hospital next week. The County has also increased the number of health workers by employing 10 Medical Doctors, 2 Specialists, 60 Clinical officers and 50 Nurses. Sang in is address said that the county was in the right path to achieving universal healthcare for the people of Nandi. In the Agricultural sector, he recognized the fact that agriculture is the backbone of our economy and indicated that his administration has done a lot to improve the sector. He cited the subsidized AI program rolled out by the county, the milk chilling tanks given to dairy cooperatives, the proposed Milk processing plant that will be set up in Kabiyet, renovations of cattle dips across the county, the partnership with Meru greens to assist farmers to plant French beans as well as distribution of coffee seedlings and Avocado to farmers cooperatives. 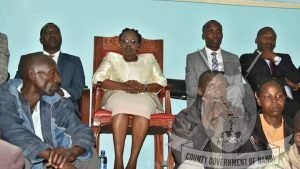 The County boss said that his administration has been able to achieve a lot in a short time due to his dedication to serve the people of Nandi. He revealed that works are ongoing at the Kipchoge Sports Academy and the first phase is almost complete adding that the National Government had committed to complete the construction of Kipchoge Keino stadium in Kapsabet. 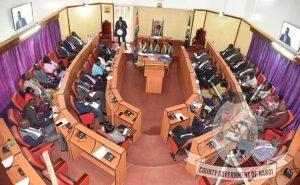 To improve the Education sector in the county the Governor said his administration has recruited 400 ECDE teachers, disbursed Ksh 102M for bursaries (60M in the first year and 42M in the second year) with Ksh 18M waiting to be disbursed to University Students in the next quarter and has allocated funds for the completion and equipping of 13 VTCs across the county. 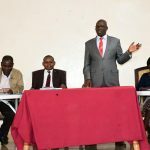 Governor Sang disclosed that Kapsabet Municipality has received Sh177M that will be used to implement various projects including the setting up of a waste management system, improvement of road network within the municipality, street lighting, pedestrian walkways, drainage and bodaboda shades within the municipality. To ensure that households get piped water, Sang said his administration has acquired drilling rigs that will be used to sink boreholes with 26 locations where drilling will be done having been identified across the county and already the process has started in Taboiyat area in Chepkunyuk ward. In the road sector, Sang disclosed that 750 Kilometers of roads has be graded, 320 Kilometres graveled and 150 Kilometers of new roads done. He added that the county government has done several bridges, culverts and footbridges across the county. The county boss also confirmed that it has not abandoned its quest to pursue justice for the Nandi people who were forcefully evicted from their lands by the British. 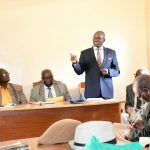 He said that the National Land Commission has ruled that former and current Kimondi Squatters, Tindiret Forest Dorobo Squatters be settled marking the first win of his administration. 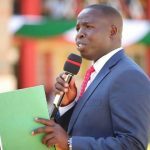 The Governor also revealed that NLC has ordered for a fresh survey of the lands held by Tea Estates to find out whether there is any residue that will be given to the county government as a trustee of the community. Apart from doing a fresh survey, NLC also directed the Multi Nationals to set up a scholarship fund to educate the Talai Children, provide public utilities to the Nandi community and renewal of land leases be held in abeyance until an agreement is reached. In his closing remarks, the County boss reiterated his commitment to deliver his promise to the people of Nandi by pledging to work tirelessly.